Please scroll down for our latest challenge which closes on Sunday 4th April at 12pm GMT. Well Done Liz, please email me to claim your prize! Wow wow wow you all really excelled on the last challenge, so many pretty girls, many of which I haven't seen before, well done all! 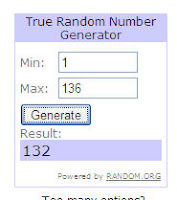 We'll be back with the winner of The Stampman voucher and our Top 5 later on. Thanks again to The Stampman for sponsoring us and to Cindy Royal for being our special guest designer and sharing her delightful creations. Also as our number of entries increases we've decided to go for a Top 5 as choosing 3 is so hard, not that 5 is any easier mind lol! Challenges will now close on the SUNDAY before the next days challenge to give us time to catch up and prepare the post. Our challenge is your interpretation of Spring be that flowers, bunnies, colours, chocolate, easter whatever spring evokes for you. Eeasy peesy! Please link to your creation in Mr Linky by SUNDAY 4th APRIL 12pm GMT and type GDT after your name if you wish to play as a guest designer on challenge 19. Our Sponsor for this challenge is the wonderful Joanna Sheen. We're also thrilled to have her join us as our special guest for this challenge so welcome on board Joanna! There are also lots of new cosmic shimmers and Sir Tim products in stock. Pop over and have a browse, there are so many gorgeous products on offer! Joanna is offering a £10 voucher for this challenge so good luck everybody! Lets see what the design team have created for their springtime interpretations, thanks ladies! 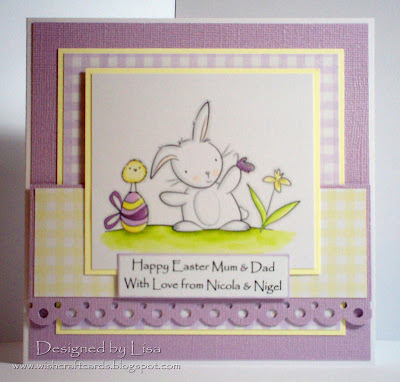 I made a square card blank from white card and put a piece of paper from K&Co Daffodil Pad onto it. 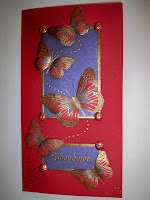 I added some silver Sakura pen to the butterflies and bees. Then I stuck a strip of Design Objectives Fancy Yellow Organza and Raffia ribbon diagonally across the card and on top of this placed my topper. 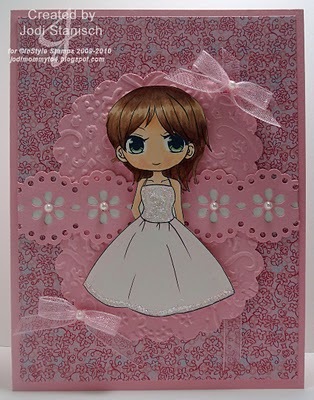 The topper was made using Nestabilities Labels Ten (cut with my Cuttlebug). 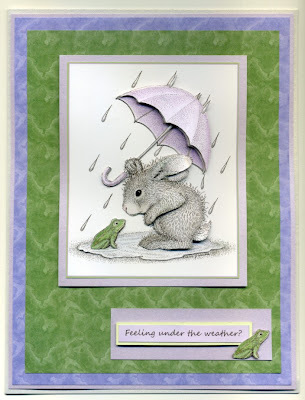 The image is from Penny Black's Critter Party, stamped in black StazOn and coloured with whispers and sakura pens. 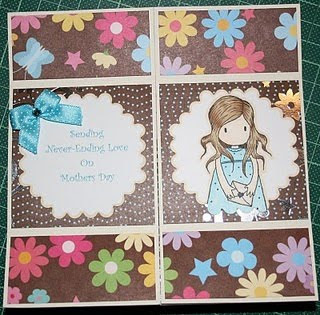 I used a white card and then printed a blue flowery card front with a white oval centre - which I bought from CraftsUPrint, and then stuck it to the card using double sided tape.Using Silver Peel Offs I added a sheep with her lamb, some rabbits, a chick and some flowers, and finally I added a narrow border using Silver Glitter Glue, both the Peel Offs and the Glitter Glue I had in my stash ... I like using the Peel offs as they are easy to use and you can add colour if you want to. I decided this week to do a large card and used a card slightly smaller than A4, I stamped Popcorn Bear Thanks a Bunch & coloured it with the good old favourites Promarkers. 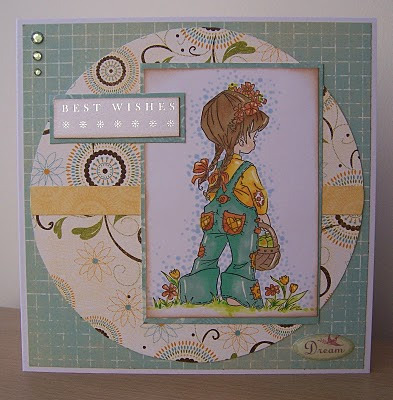 I then decided on the colours for matting and layering, use some ribbon and a message from a kit I have had for some time and finished the card off with the brads, flowers and gems. 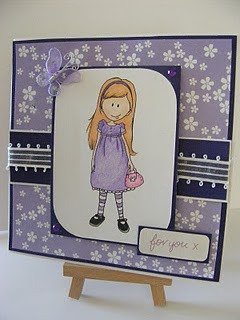 It is nice to make a card when it is for someone special, hope you enjoy this challenge. Pale Lilac, RV95 Baby Blossoms and E04 Lipstick Natural. 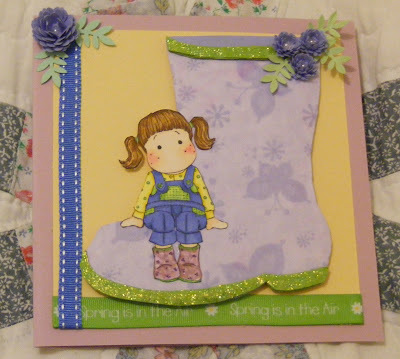 Using a lilac blue butterfly paper found on the internet, I cut a boot. I added blue to the inside of the boot. Also, I added a green top band and sole, which I then added green stickle to them. The flowers are created using a daisy punch. I layered up 7 punched flowers with a pearl in the centre. The leaves are also a punch. I stamped both the images in Memento Black Ink and coloured them in with copics. 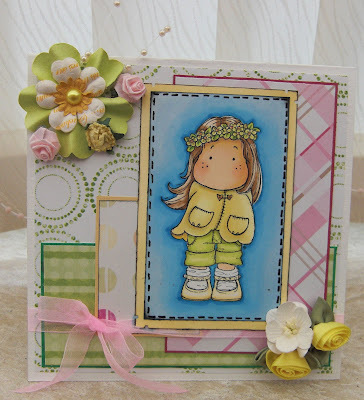 The boots are coloured in first with colour and then using the Colourless Blender, to create a spotty effect. I then glued, Spring Tilda onto the boot. 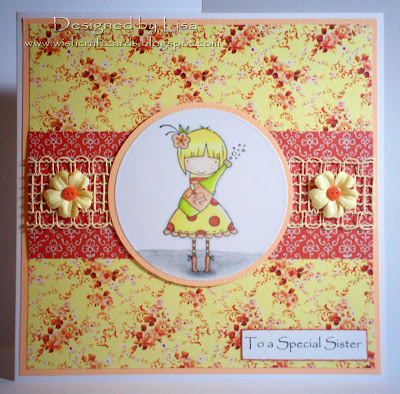 I used a creamy yellow card to create a square. I added Ribbon to the bottom and the side. This I mounted on to a lilac/mauve card. I added a larger flower and also some leaves. 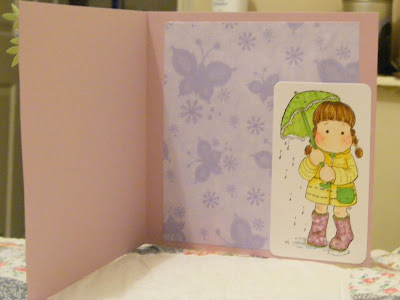 For the inside I used the same paper as I used for the boot and then added Spring Rain Tilda to the inside. My challenge card this week was a pretty hard one to start with...my mojo has not been playing the game for over a week but when Vix told us Joanna Sheen would be featured, my mind went into overload...Joanna has been in my crafting world since the day I started crafting almost four year's ago, ...back then blogging was not in my life and the only help I found was Create and Craft... Joanna was one of my main influences, I learned so many techniques watching her programmes. 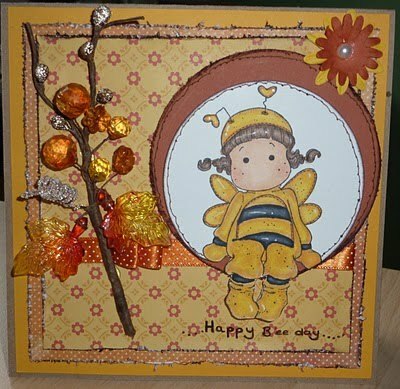 The card I made today was inspired by one of Joanna's CD's, I use this particular CD as a background for my images so often, it's the Pamela West CD, it's full of perfect images for any sort of card and a great back drop for any image...and if your at the NEC this week Joanna I will be making a bee line for you!!! With an average of 3000 hits a DAY to her website, Joanna Sheen is certainly a leader in craft circles. She has won the Craft Hobby & Stitch Cardmaker of the Year award for the last 3 years along with Best Craft Website/Online Retailer for 2008 & 2009. 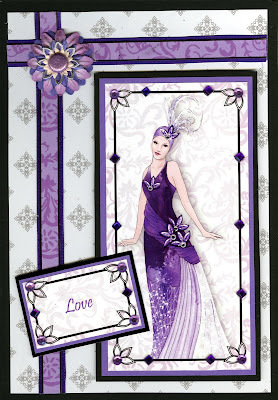 She is also highly regarded as a Queen amongst us cardmakers and makes frequent appearances on Create and Craft TV. I shall hand you over to the lovely Joanna Sheen. 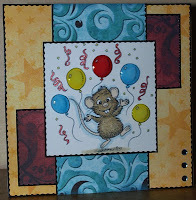 This is a very straightforward simple card – the beauty comes from the House-Mouse artwork. 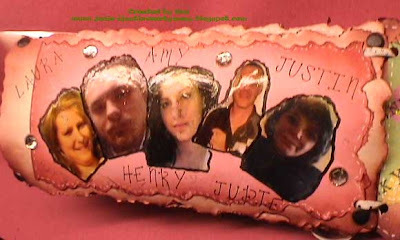 Cut out the decoupage sheet and assemble using pinflair glue gel and leave to dry preferably overnight. Cut an extra piece of card slightly smaller than the main blank and layer two colours of backing paper printed from a cd (these came from my ATC one) I use double sided tape as I prefer tape to wet glue. 1. One thing I read about you was that you were thrown out of art class but luckily for us you pursued your dream and passion. Can you describe your journey to where you're at now? I struggled so badly with still life charcoal sketching – I do wish they had done something with potato printing I managed that from an early age! Having dropped out of Law College (sorry lawyers but it was dead dull really) I trained with Constance Spry in London to become a professional florist but having a small baby really made that idea a bit difficult to follow through. Then I came up with the idea of working not with fresh flowers but dried and pressed and had twenty very happy years with a thriving business as a result. I approached Ideal World about 7 or 8 years ago and they were so welcoming and within days of contacting them we had a show sorted out and despite my nerves – it all happened! Alan and Barry were presenters back then and I dressed up a bit like the Mother of the Bride in retrospect – far too formal – but with that first show under my belt – it was all go go go from there! 2. Who/What/Where do you get your inspiration from? I get inspiration from all four corners of the earth – thank goodness for the internet and the friends that I have made all over the world. They give me ideas and inspiration and often just a comment can make me go searching for more ideas and so things begin to build. Always the garden and the Devon countryside will add some inspiration if I get stuck as does my small spaniel who would jot down ideas for me if only he could write! 3. Julie would like to know how organised is your craft room and any tips for getting organised? Oh Julie – I can see you have never been to my house – total chaos six days out of seven my craft room. I do try and tidy up once a week but within minutes we seem to be back at square one – just so many boxes and cupboards that I want easy access to all the time. My only tip is that life got easier for me when I had some kitchen units put into my craft room as that gave me a surface that I could stand at as well as some handy drawers and cupboards. I also rely very heavily on the “really useful” range of plastic boxes … brilliant things! 4. 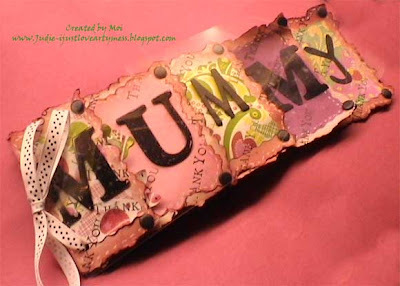 What do you like most about crafting and the craft community? 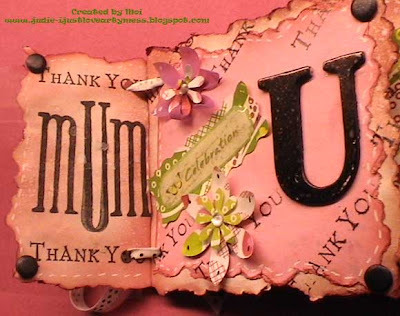 I love the feedback you get when you give cards – I like pleasing my friends and family and it’s great when a card is precious. The craft community is pretty special too, crafters on the whole seem so much kinder than the average person and the people I have met and regularly chat to are just the best people you could hope to share your life with.